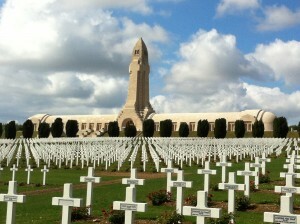 Verdun was the longest battle of the First World War. The German Chief of Staff, Erich von Falkenhayn sent a letter to the Kaiser, Wilhelm II, on Christmas Day 1915. In it he stated that he that the key to winning the war did not lay on the Eastern Front but on the Western Front and that if France could be beaten in a set piece battle then Great Britain would seek terms with Germany before she was beaten in turn. Falkenhayn (pictured left) also wrote that he believed that Britain formed the base of the Allied effort ranged against Germany and that she must be removed from the war. To do this he recommended to the Kaiser unrestricted submarine warfare against Britain’s merchant shipping effectively strangling her supply line and starving her into submission. This combined with a blow to France would bring about a successful conclusion to the war. Despite running the risk of bring the USA into the war, the Kaiser sanctioned unrestricted submarine warfare and the set piece siege of Verdun which was Falkenhayn’s chosen target. Falkenhayn’s choice of Verdun was shrewd. Although relegated by France to the status of a minor fortress during the early stages of the war, Verdun maintained a great psychological hold in the minds of the French people as the last fortress town to fall to the Prussians in the Franco-Prussian war of 1870-71. Verdun’s fortifications had been significantly boosted in the 1880s to withstand further attacks and in addition, its status as an important fortress since Roman times guaranteed recognition of the name ‘Verdun’ to most Frenchmen. In short, it was of greater value symbolically than strategically and Falkenhayn counted upon this. His plan was to subject Verdun to intense bombardment, thus drawing in and diverting French troops from all over the Western Front to the eight mile wide front around Verdun. Falkenhayn stated that his aim was to “bleed France white” in its defence of this ancient fortress town. 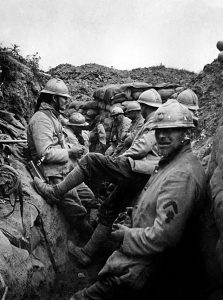 The fact that Verdun formed a French salient into German lines only served to help Falkenhayn, since it meant that it was open to attack from three sides at once. The task of laying siege to Verdun fell to the German Fifth Army under the command of Crown Prince Wilhelm. His plan was to assault the town from both sides of the surrounding Meuse River. This plan vetoed by Falkenhayn, who, cautious by nature, feared heavy losses and ordered the attack to be confined to the east bank of the river. Originally scheduled to start on 12 February 1916, poor weather caused the offensive to be postponed until 21 February. Its start proceeded a 21 hour preliminary bombardment. In the interim, between the planned and actual start date, French Commander-in-Chief Joffre (pictured right) received intelligence of the imminent attack and reinforced the French Second Army. 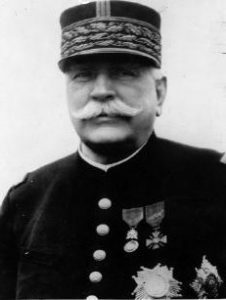 Fortress commander, Lieutenant Colonel Emile Driant, also a politician and published author, attempted in vain to improve Verdun’s trench systems in time for the coming assault. Posting two battalions, led by himself, at the tip of the Verdun salient on the east bank of the Meuse River, he faced formidable opposition as his 200,000 troops faced 1,000,000 German troops. The attack began at 07:15 on 21 February with Crown Prince Wilhelm opening the battle with 1,400 guns packed along the eight-mile front opening up a huge bombardment. These guns were well served by good nearby railway facilities and 100,000 shells poured into Verdun every hour. Wilhelm’s aim was to kill the majority of the French defenders before he released his infantry at the fortress. Following this initial bombardment, a German scouting party reported later in the day that half of the French fighting force remained to meet the planned attack. It is arguable that had Wilhelm chosen to attack at this point the fortress might still have been taken. Instead, daunted by the apparently formidable defences, Wilhelm chose to renew the bombardment. By the close of the day, the German forces had succeeded only in capturing the French front line trenches, less than planned. 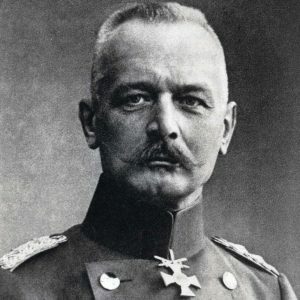 Wilhelm pulled back his forward infantry in preparation for a further artillery bombardment. This broke up the momentum that had been generated earlier and allowed the French defenders to position themselves in such a position that they were able to enfilade the advancing German troops from across the river. 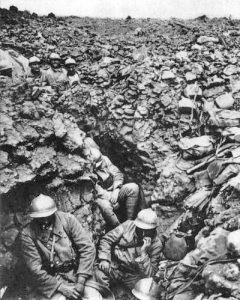 Verdun remained in French hands, although the defensive situation was dire. A message was sent to French headquarters on 23 February reporting that Driant had been lost, along with all his company commanders. Also, his two battalions had been demolished and had only 180 men left. The following day, 24 February, German troops succeeded in over-running the French second line of trenches, forcing the defenders to within 8 kilometres of Verdun itself. Nevertheless, the two outer forts, Vaux and Douaumont, continued to hold out. A French division sent in piecemeal on the 24th but dispersed under heavy German artillery fire and the following day Fort Douaumont fell to the 24th Brandenburg Infantry Regiment. This had a major effect on the morale of remaining defenders and the reinforcements freshly arrived. French sentiment demanded its recapture and the withdrawal from Verdun was therefore politically impossible. Joffre, the French Commander-in-Chief remained unflappable. He issued a statement noting that any commander who gave ground to the advancing Germans would be court-martialled. He then dismissed General Langle de Cary, who was responsible for the defence of Verdun, for deciding to evacuate Woevre plain and the east bank of the Meuse River. In his place he promoted Henri-Philippe Petain, a talented officer whose progress through the French army had been slowed on account of his defiance of the prevailing motto of ‘attack at all costs’, believing that this was a recipe for disaster, defensive technology being so much greater advanced than offensive technology. Pledging to Joffre, “Ils ne passeront pas!” – literally “They shall not pass!” Petain telephoned the commander of the Verdun front line and instructed him to hold fast. In a way, Petain’s appointment could not have suited Falkenhayn any better for a quick German victory at Verdun would hardly meet this criteria of bleeding the enemy white and so Petain’s dogged determination to hold out suited Falkenhayn’s intentions perfectly. However, he could hardly have determined just how effective Petain’s defensive strategies turned out to be. Petain understood that the defence of Verdun would result in many French casualties and that the nature of the terrain made this inevitable. However he was determined to inflict the maximum damage to the German invaders in the course of these losses. To this end, Petain personally took command of the artillery and effectively re-organised its use. 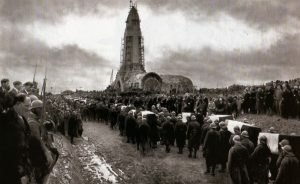 He also ensured that an effective supply route to Verdun was maintained, designating a single artery road leading to a depot 50 miles to the west, Bar-le-Duc. He ensured constant access by assigning columns of troops whose sole duty it was to maintain clearance of the road and to perform repairs when and as necessary. The road was christened ‘Voie Sacree’ – the ‘Sacred Road’. On 6 March after receiving fresh artillery supplies the Germans began a new offensive after receiving fresh artillery supplies. They made great progress until French counter attacks pushed back the advancing German infantry. For the remainder of the month Wilhelm launched repeated attacks against the French reinforcements constantly pouring into the fortress. 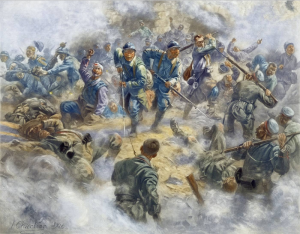 Of the 330 French infantry regiments of the French army, 259 eventually fought at Verdun. Another German corps of men was committed to an attack up the left bank of the Meuse River towards a small ridge named Le Morte-homme (the ‘Dead Man’). This battle raged continuously without conclusion. The third major German offensive of the battle was launched on 9 April on both sides of the salient. Once again Petain’s defences held with attacks and counter-attacks continuing until the close of May. The German forces were inching closer to the remaining forts every day. During this period Petain received a promotion and was replaced at Verdun by the aggressive Robert Nivelle. Mort Homme Hill was secured by the Germans on 29 May and finally, on 7 June, Fort Vaux fell. Situated on the east bank of the Meuse River, the fort had held out against constant bombardment since the start of the battle in February. However, by now out of reserves of water and the fort itself lying in ruins, its French defenders could hold out no longer. With the capture of the fort, Wilhelm offered his congratulations to the fort commander, Major Raynal, for holding out so long. Encouraged by this success, the German troops almost succeeded in breaking through the French line at the close of June and into early July. It was at this stage in the battle that the latest form of chemical warfare was unveiled by the Germans: phosgene gas, which acted by forming as hydrochloric acid once inhaled into the lungs. Meanwhile, Joffre pressed the British government to stage a major diversionary offensive elsewhere on the Western Front in an attempt to drain German manpower away from Verdun. The Battle of the Somme that was originally scheduled for the 1 August was brought forward to 1 July upon the insistence of the French. Against Nivelle’s recommendation, Petain recommended a withdrawal from the western Meuse line. Joffre, however, supported Nivelle in dismissing the suggestion, a decision that was vindicated by a sudden drain upon German resources as a result of a Russian offensive that took place on the Eastern Front causing fifteen German divisions to be withdrawn from Verdun to aid the eastern defences. By this stage of the battle the German Chancellor, Theobald von Bethmann-Hollweg, was scathing in his condemnation of Falkenhayn’s lack of success at Verdun. The battle was proving as costly in terms of manpower to Germany as it was to France. Consequently, Falkenhayn was dismissed by the Kaiser and dispatched to the Transylvanian Front on the 29 August to command the Ninth Army. Falkenhayn’s arch critic, Paul von Hindenburg, replaced him as Chief of Staff, buoyed by his successes in the east. A new French commander of the Verdun forts, Third Army’s General Charles Mangin, was also appointed, reporting to Nivelle. Taking the offensive Mangin managed to retake Douaumont on 24 October and Fort Vaux on 2 November. Following a pause, Mangin renewed his offensive, retaking ground lost at the start of the German attack. Between 15 and 18 December when the battle ended, the French had taken 11,000 prisoners and 115 heavy guns. Simply put, Hindenburg saw no point in continuing Falkenhayn’s pointless attacks. French casualties during this battle were estimated at 550,000 with German losses set at 434,000, half of these totals being fatalities. The only real effect of the battle was the irrevocable wounding of both armies. No tactical or strategic advantage had been gained by either side.